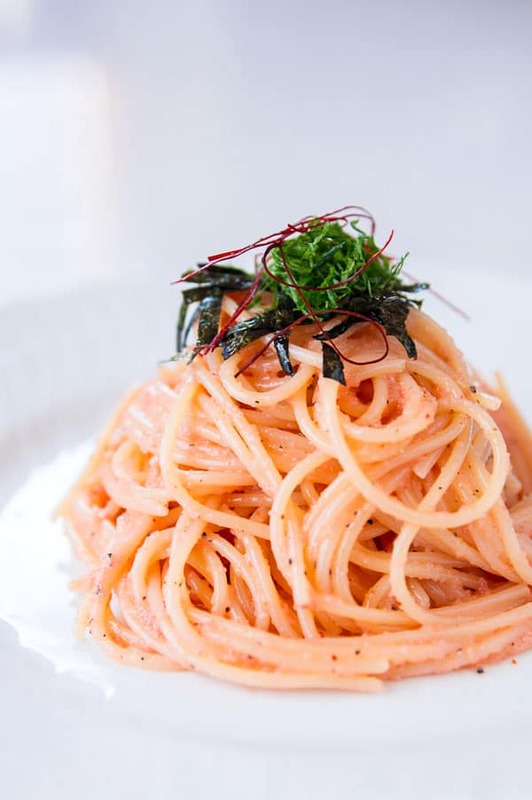 Mentaiko Pasta (明太子パスタ) is a simple Japanese-style pasta sauced with olive oil, butter, and spicy cod roe that comes together in minutes. Mentaiko is made by brining and seasoning fresh pollack or cod roe, which gives it a pink color. Unlike bottarga, it’s not dried, so the tiny eggs make a creamy sauce when added to hot pasta. The creamy olive oil tames the spicy brine of the mentaiko, while the shiso offers up some herbaceous notes that contrast nicely with the intense essence of the sea. When preparing this pasta, be sure you use a mild creamy olive oil. Grassy or spicy olive oils tend to clash with the roe making it taste bitter (kind of like drinking orange juice after brushing your teeth). You can always test for this by mixing a small amount and tasting it. If you can’t seem to find an olive oil that works, you can always just use regular vegetable oil. I also like adding a bit of butter in to make the pasta a bit more creamy, but if you’re worried about the fat, you can leave it out. If you get your mentaiko (a.k.a. spicy cod or pollack roe) in a jar you can just measure it out into a bowl. Otherwise cut each roe sac in half and squeeze out the roe from each half, discarding the membrane. Add the olive oil and black pepper and stir to combine. Meanwhile boil a large pot of well salted water and cook the pasta according to the package directions. 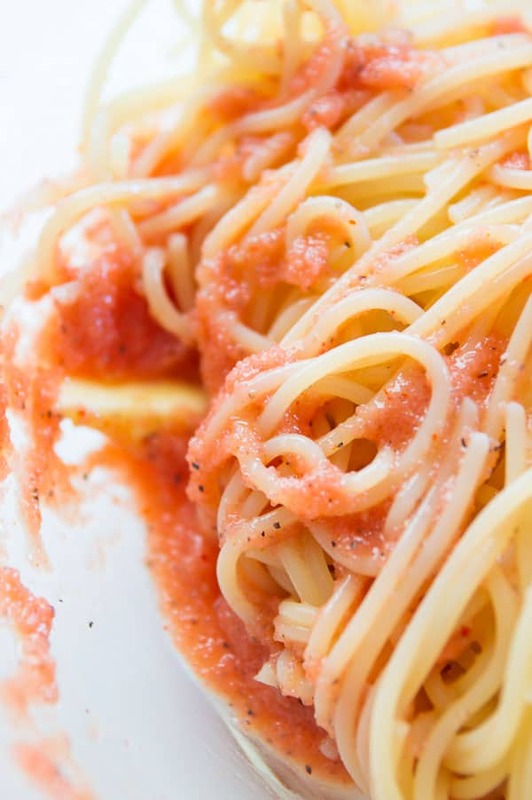 When the pasta is done, drain thoroughly and add to the bowl with the mentaiko sauce. Add the butter and toss until the butter is melted and you have an even coating of sauce on each strand of pasta. Serve immediately, garnished with shiso and nori. Hahaha, awesome! I vaguely remember leaving that comment somewhere! This pasta is even simpler. Lately I’ve been dropping in an egg yolk into the hot pasta to make it a little more creamy. I love mentaiko pasta. I’ve tried the packaged kind before and it wasn’t too good. I know now to always go with fresh for this dish. Thanks for the post. This was my favorite dish to order at “On the Bridge” in Japantown! 🙂 Now I can make it! Made this tonight, it was great! The shiso really does add a nice flavor touch. Mmm that looks and sounds perfect. Think you could use smoked roe? I don’t see why not. With dryer roes (like bottarga), you’ll want to grate it first. Thank you for making this site very interesting! Keep going! You’re doing very well! I’ve made something similar with myeongranjeot (Korean-style preserved cod roe) in a carbonara base. Yummy! I love this dish. I personally prefer it using all butter, no olive oil. Yabaii~!!!!! chooooo oishsou~!!!! I miss eating eating mentaii ko!! I found your blog a few days ago and have since devoured every recipe, every picture and anecdote. Thank you for such a rad blog. I’m planning on making this this weekend for my Japanese husband. Hopefully, he approves. 🙂 Please keep writing and taking gorgeous pictures! You can also use canned pollock roe that could be bought in any russian shop. It has a comewhat different spices, but is already pretty creamy, as it’s usually used as a sandwich spread. With pure butter it works wonders in mentaiko pasta, though the olive oil makes it a bit too sharp. Hi Leksvik, it’s thinly sliced dried chili pepper. Mentaiko is pollack roe, so I guess that would work better, but having never had canned pollack roe or lumpfish roe I really couldn’t say. What about some sesame oil? There is something very symbiotic about raw egg yolk and sesame oil? Thank you! It tastes so authentic, just like what they serve in Tokyo. So glad it’s that easy to whip up this dish. Delicious! Made this tonight for my extended family, and everyone had second helpings.